If you’re a fan of Temple Run and its sequel, there’s a high probability that you will like Temple Run Oz as well. The game is available for just $0.99 from the App Store, but you can grab it free of cost from the Apple Store app. It’s a part of the Apple’s on-going promotion that offers iTunes content free of cost. Temple Run Oz is a combined venture of the folks at Imangi and Disney where you will play as Oz and must outrun the devilish baboons across the land. It’s quite similar to the earlier Temple Run versions where you run as an endless runner and try to get as many points as possible. If you don’t have the Apple Store application, you can grab it from the App Store from this link. 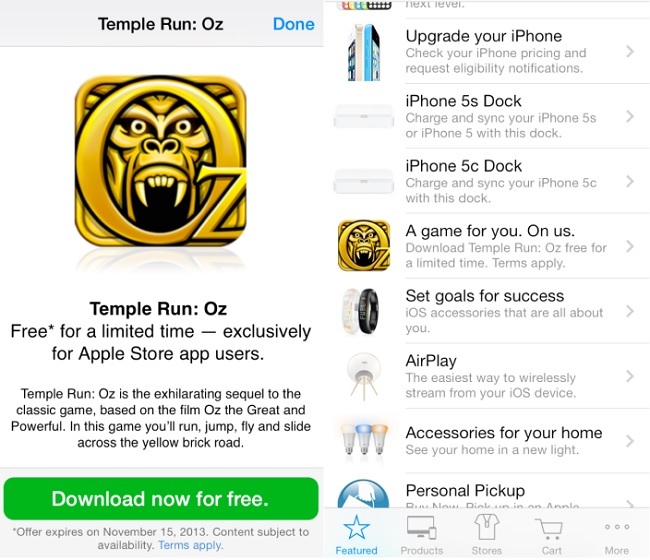 Once installed, head over to the Featured tab and you will find Temple Run Oz listed there. The application is sized at 46MB requires iOS 5 and above. However, for best results, you should be on iOS 6 at least. The promotion is valid until November 15th according to the Apple Store app, so hurry up and download the application.